Then, I pulled the Ace of Wands. The Ace of Wands to me is a spark, a lit match, the flash of inspiration that reveals an amazing idea. A eureka moment. We are being offered a gift, a magic wand. We have the opportunity to connect with our soul, to understand what we are truly passionate about and how to go after it. There is determination here, a chance to feel fully alive and unstoppable. This card is also an invitation to up your gumption game. Get excited, take action, stop waffling. Feel your power and wield it well. 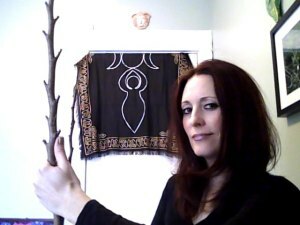 Being the suit of Wands, we are in the world of fire, passion, creativity and action. That wand is just a stick, but it has leaves bursting out from it, it is full of life that wants to expand and flourish. Being an Ace, we have a new start here, pure potential that needs to be nurtured if it is going to get anywhere beyond an idea. So what might the Ace of Wands represent in regards to a specific topic? Ace of Wands in Love: A passionate love affair begins, the sparks are really flying. The potential for more, if both people are willing to put in the effort. This Ace could also represent an opportunity to bring the fire back to a relationship that may have cooled over the years. Ace of Wands in Career: A really good idea for a business or project. A new job or career is within your grasp, one that has an entrepreneurial feeling, or is in a field that is creative, flexible and innovative. It is up to you to take action and to run with the chance that comes your way. Focus your energy on one project or goal rather than multi-tasking or spreading yourself too thin. 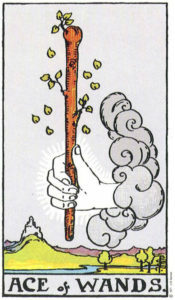 Ace of Wands in Well-being and personal growth: Increased confidence and vitality. Feeling excited and in your zone. Knowing that you have an ace up your sleeve, so to speak. Focus your energy on something or someone who makes you feel ALIVE and full of possibility, the mundane tasks can wait. When the Ace of Wands appears, the Muse is speaking to you. May you hear her message, and be inspired to new levels of creativity, courage and growth. Get fired up!